You've found the “U.S. Welsh Harlequin Duck Breeders” page here at Hobby Farm Wisdom! If this is the first time you have visited our site: Welcome! 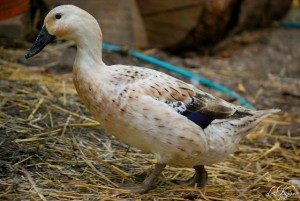 The Welsh Harlequin is a domestic duck breed that is native to Wales. It was originally developed after Leslie Bonnet discovered a color mutation in his flock of Khaki Campbells and started selectively breeding for it. Welsh Harlequin ducks are a light weight breed weighing only 5 ½ pounds with vibrant plumage and excellent egg laying ability. They are excellent foragers, produce a lean carcass and are highly valued for their egg production. They can produce 240 – 330 white eggs annually. Welsh Harlequin ducks are also prone to broodiness and can often produce young with no human interference. While they are active birds, their temperament is docile making them excellent backyard ducks.